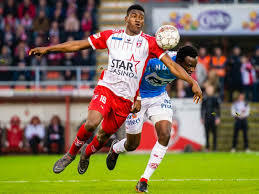 Nigeria’s U23 Men’s National Team coach Imama Amapakabo says he has received assurances from in-form Royal Excel Mouscron striker Taiwo Awoniyi to be part of next week’s qualifier against Libya in Asaba. The former Flying Eagles and Golden Eaglets star, who is on loan at the Belgian side from Liverpool, has netted 7 times in 8 games since rejoining Mouscron in January. In a chat with journalists in Lagos on Sunday, the former Rangers coach disclosed that Awoniyi confirmed he will storm the U23 camp later today to bolster the squad ahead of the AFCON qualifier against Libya on Monday, 25th March at the Stephen Keshi stadium in Asaba. “We drew up a list of players that we wanted to come into camp, unfortunately, up till two days ago we were still having challenges in respect of the local lads (home-based players),” Imama informed. “We are fortunate that we’ve been able to call up some players from Europe and the response has been wonderful. In spite of Awoniyi’s imminent arrival, Amapakabo admitted it has been difficult to set up the team but promised to do the nation country proud with the U23 side.